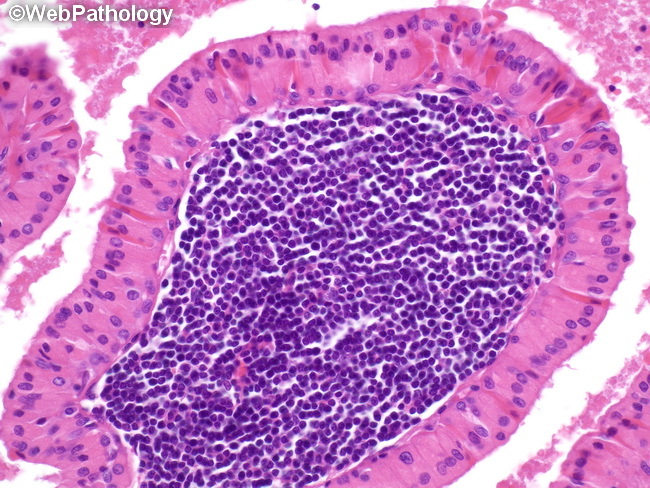 Higher magnification image of Warthin�s tumor demonstrates papillary structures lined by bi-layered epithelium. The inner layer (basally located) is discontinuous and composed cuboidal cells with eosinophilic granular cytoplasm and vesicular round nuclei. The columnar cells are located on the luminal aspect. The stroma is well demarcated and composed of benign lymphocytic infiltrate.